In May Vice-President Jennifer Heenan welcomed everyone to the meeting. Our speakers for the evening were from Tescos and they gave a very interesting and informative talk about the food they sold. They then gave out ‘goodie bags’ to everyone. Susan McDowell gave the vote of thanks. The competition for a shopping bag was won by Doreen Radcliff with Margaret McCall second and Judith Wainwright third. The ballot was won by Eileen Milligan and the Birthday gift by Mavis McKinstry. Mavis was given good wishes for her up-coming operation. 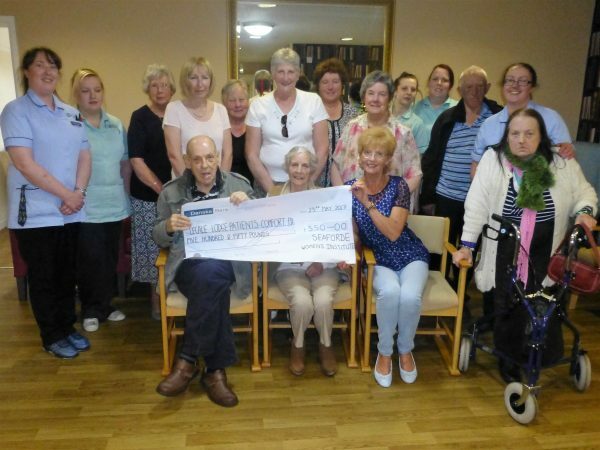 Seaforde WI visited Lecale Lodge Residential Home to present a £550 cheque for the Resident’s Comfort Fund. This money was raised at a Quiz night in the Lakeside Inn. The photo includes WI members and residents and staff of the home.